Harriet Beecher Stowe (1811-1896), author, humanitarian, and abolitionist, lived in this house from 1850 to 1852 during which time she wrote her famous novel Uncle Tom's Cabin. 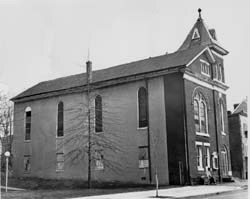 Born in Litchfield, Connecticut, to a notable Congregational minister and his wife, Harriet Beecher Stowe moved to Cincinnati, Ohio, in 1832, where she taught at the Western Female Institute. While living in Cincinnati, she met numerous fugitive slaves and traveled to Kentucky where she experienced the brutality of slavery first-hand. It was also in Cincinnati that Harriet Beecher met her husband, Calvin Ellis Stowe, a teacher at the Western Female Institute. In 1850, Calvin Stowe accepted a teaching position at Bowdoin College and the couple moved to Brunswick. Harriet Beecher Stowe was encouraged to write by her husband and was a published author before moving to Maine. Based upon her experiences while visiting Kentucky and her interviews with fugitive slaves, Stowe started writing Uncle Tom's Cabin upon her arrival in Brunswick. Many of the characters in her book mirrored real-life individuals such as Josiah Henson, a fugitive slave who escaped from Kentucky to Canada along the Underground Railroad with his wife and two children. Published as a serial in the abolitionist newspaper, National Era, in 1851 and in book form the following year, Uncle Tom's Cabin is considered to be the most famous example of antislavery literature. The book became an overnight sensation in the United States and Europe and has been translated into 23 languages. Harriet Beecher Stowe introduced the horrors of slavery to large numbers of Americans and became the object of violent hatred throughout the South. Her reply to southern criticism came in 1853 when she published A Key to Uncle Tom's Cabin, a collection of factual material on slavery intended to justify the charges implied in the novel. The impact that Uncle Tom's Cabin had on the American public was so great that President Lincoln, upon meeting Stowe, is reported to have said, "You're the little lady who started this great war." Though not directly linked to the activities of the Underground Railroad, the Harriet Beecher Stowe House, a National Historic Landmark, is the place where this influential writer penned her monumental novel, forever changing America's attitude toward slavery. 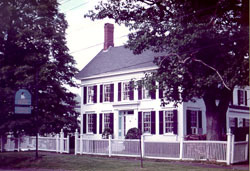 The Harriet Beecher Stowe House is located at 63 Federal Street in Brunswick, Maine. The house now is owned by Bowdoin College and is not open to the public.